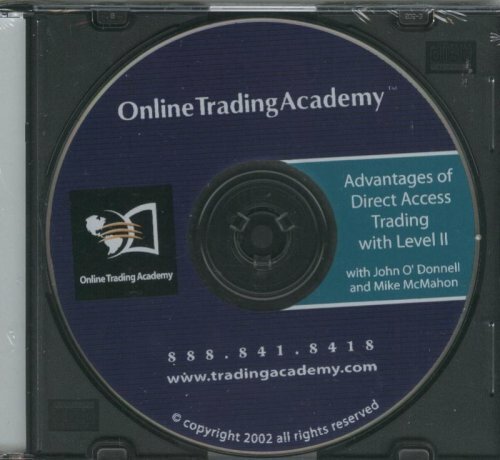 A Must for Understanding the New Tools of the Trade Advantages of Direct Access Trading with Level II is an excellent introductory course hosted by John O'Donnell and Special Guest, Mike Mc Mahon. The course speaks about the current environment of the market and the problems associated with the Market Maker and brokerage community, including payment for order flow and other behind-the-scenes deals that exact a toll on every online trade you make. Mike then takes you into the depths of Level II usage, explaining how it works, why we use it and demonstrates the control and speed of direct access trading. After seeing this highly graphic presentation, John and Mike invite you to look deeper into becoming a Market Professional and how to invest in yourself with a comprehensive education and a step-by-step plan for fulfilling your financial dreams in any market. This CD is geared for 2 audiences: 1) the complete market novice who is attempting to determine what course of action to take in becoming involved with investing or trading and 2) the online trader seeking to understand why to make the switch to direct access trading and the inherent advantages in direct access platforms and systems. Current direct access traders may find this a useful tool in introducing others to the direct access trading world. If you have any questions about this product by Trading Academy, contact us by completing and submitting the form below. If you are looking for a specif part number, please include it with your message.